William McKinley is featured on each $10 third charter note. The ten dollar denomination is the most common 1902 red seal. However, it is still usually quite scarce. Red seals were only printed between 1902 and 1908. Survivors usually represent the best available note from a bank. The exact value is always based on the condition and bank of issue. 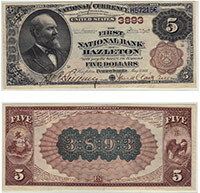 It is not unusual for scarcer examples to be worth thousands of dollars. Please contact us for details. Don't forget to check the serial number. Number 1 notes always sell for nice premiums.